I'll never forget the first pirate video I ever saw: Teenage Mutant Ninja Turtles. I was 10 and had been waiting for forever to see the movie - I had even memorised the Turtle Power rap. It felt weird breaking the law - the only other time I had done it at that age, was racing through a red light on my BMX. I can't remember the person who got illicit recording for me but I remember the film, it was so dark. Shot covertly, no doubt by a camera stuffed between two seats, it made the Turtles movie look like some sort of exploitation flick but I loved it. There I was enjoying a film that I should have been watching on a big screen on a small colour TV, in 4:3, with a picture so dark and fuzzy the turtles looked like Splinter and Splinter like the ooze. But I was watching the movie in my own home - months before it would ever be released legally - and that made it the best thing I had ever seen. Quality wise, VHS was a terrible format, but it's something that will always hold fond memories for me. The cassettes themselves were clunky, the mechanism to play, fast-forward and rewind them archaic but it was the format that truly brought movie watching to the home. It created the idea of a movie collector, something that's still thriving today. Going to a video store and looking at all the VHS covers was one of my favourite things to do on a Saturday. This was the '80s, the era of video nasties, and I lapped up all of the images I saw but wasn't really meant to see. The covers were lurid, exciting and portals to a forbidden world. A world that would soon disappear when my parents would only allow me to rent something like Mac And Me. The issue with VHS for many was that it was a format built to degrade and was easy to ruin. Everyone has stories about people taping over important things on VHS and I'm the same. History has it that my gran taped over my parent's wedding with the UK soap Coronation Street. And it was at my gran's where my final fond VHS tale happened. It was 1992. My brother and I were back from the local video store with our Holy Grail, the only copy of Terminator 2: Judgement Day for miles around. There we were, 7PM, ready to watch the movie. Some time in and Arnie is visiting a jail with a gun hidden in some roses - the heavy handed symbolism was lost on me at the time - we watched, our mouths filled with microwave popcorn and the worst thing-ever happened, the screen warps and a chewing sound is heard. My gran's machine was eating the tape, like some sort of Stephen King tale. Chewing it, ruining it, making sure the VHS was pretty much unplayable. A tear in my eye, I called for my mum. She came rushing in fearing the worst, but not understanding that it was far worse than what she was thinking: the VCR has eaten Terminator 2, the only copy for miles around. My mum, being as awesome as mums are, calmly unspooled the ruined tape, ironed it out as much as she could and fixed the tear with sticky tape. It was a miracle. Yes, the offending part was warped and unplayable but it meant we could watch the rest of the movie and hand it back to the video store without anyone knowing what happened. It was the perfect crime. It wasn't. After that happened, my gran dodged angry letters from the video store for months, demanding hundreds for a replacement tape, but she feigned ignorance like the boss she is until they went away. It's memories like these that make me love VHS, even if the majority of people hated it. It was the worst format for movie watching because it never showed off the director's true vision but it was a big part of my growing up and becoming a self-confessed film geek. The thrill of popping in a new VHS has never been bettered. Not by DVD, Blu-ray or streaming. 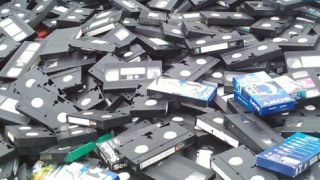 This doesn't mean that VHS will ever have a revival like vinyl has, because it was never revered that way. It's not like any of us miss the needless letterboxing or myriad adverts before the main movie that had to be fast-forwarded, but that's fine by me. It was always a format that tried to kill itself. Blank VHS, that had numerous things taped on them, would always start showing up ghosts of the images that were recorded the time before - it was always like the format was tearing itself apart, coaxing something better to come along and supersede it. Some things are better left in the past and VHS is one of them. But that doesn't stop some of my best movie memories being about, and on, VHS. And because of this, after all these years, I'm sad to see it finally go.